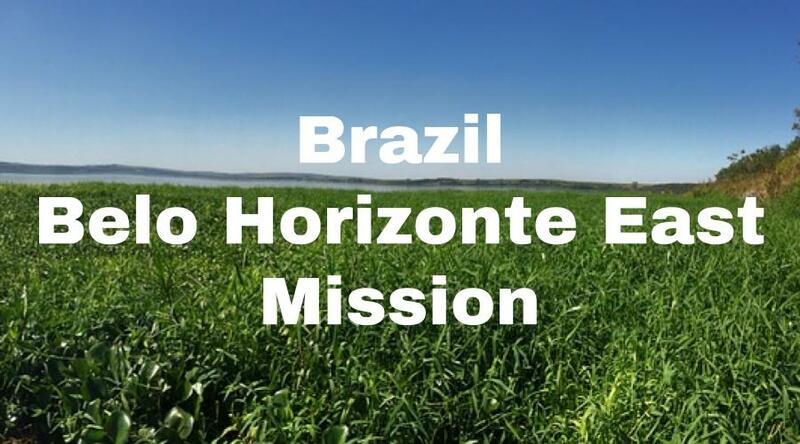 Here’s a recent address for the Brazil Belo Horizonte East Mission. We try to keep this information up to date, but it’s a good idea to check the mission address with several sources, including your mission packet or the mission office. Here’s a list of LDS missionary blogs for the Brazil Belo Horizonte East Mission. This blog list includes the missionary’s name, URL and when their mission blog was updated. Here are Brazil Belo Horizonte East Mission Groups- for LDS missionary moms, returned missionaries, mission presidents and other alumni of the mission. Here are T-shirts for the Brazil Belo Horizonte East Mission! 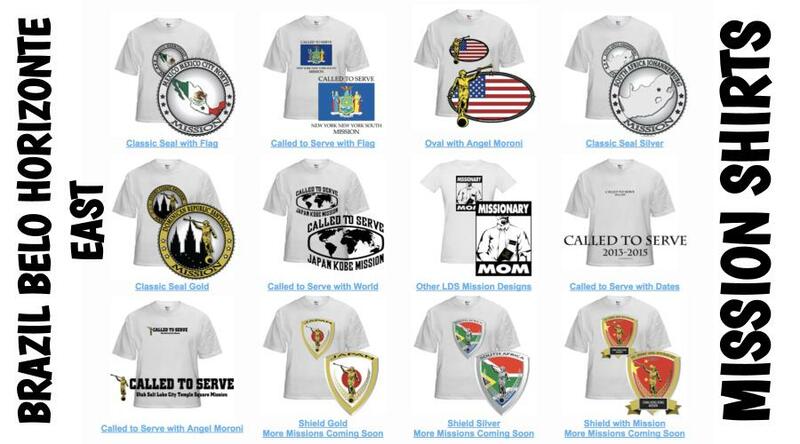 Shirt designs include Brazil Belo Horizonte East Mission logo/emblem shirts and Called to Serve shirts. The shirts make great gifts for pre-missionaries, returned missionaries and missionaries currently serving. LDS Mission shirts come in all sizes: Small, Medium, Large, Extra Large, up to 4XL. The mission designs are printed on white shirts and are shipped to you. *Simply click on a shirt design to view the details and submit an order. The designs on mission t-shirts may also be printed on other LDS mission gifts, including: Brazil Belo Horizonte East missionary aprons, Christmas stockings, ties, pillow cases, teddy bears and Christmas ornaments. Here’s a list of current and past Mission Presidents of the Brazil Belo Horizonte East LDS Mission. Here are survey responses from Brazil Belo Horizonte East RMs, to give you a snapshot into what it’s like to live in the mission. What are some interesting facts about the Brazil Belo Horizonte East Mission? Any advice/testimony for pre-missionaries going to Brazil Belo Horizonte East? The mission is probably 14 hours from top to bottom by bus. It covers a pretty large state that no one has heard of above Sao Paolo. Everyone in the mission goes to the temple in Sao Paolo. I wasn’t able to go to the temple. Get used to that. It wasn’t really a detriment because the Lord blesses missionaries and I’m sure he will bless them for their lack of temple attendance in that time. About 20 years ago, there were a couple missionaries in the southeast in a very small Catholic town that decided to kick a statue in the town and it broke and the town went nuts. The missionaries had to move out and every member had to leave the town or leave the church. Don’t do stupid things as a missionary because you represent something much greater. It was a serious problem. There was rioting. Don’t be stupid and remember who you are. When I was in Brazil the church reached just over a million members in Brazil. Most of the people there were already believers, so they are so ready to receive the gospel. They have a desire to learn the truth. The growth rate is incredible. Our mission went from 45 baptisms a month to over 150 a month. There are a lot of really strong Catholics in Minas Gerais, so it was hard to pull them out of their traditions. But, overall, people were receiving of the truth. The Belo Horizonte Mission has a lot of opportunities to serve. You can be called to labor in anywhere from developed wards and stakes to branches where you will have a variety of different callings. You may even have to serve as a branch president. The sun can be hot sometimes and the day can be long, but when you teach a lesson and feel the spirit you will feel that it is all worth it. There’s no greater joy than seeing someone choose to follow Christ and be baptized. The members are really willing to help, and they will bear powerful testimonies as they come with you to lessons. An even greater joy than seeing someone be baptized is seeing them be fully integrated with the members. It’s great to hear how those members who visited them become their best friends and help them stay strong. My number one recommendation is to work with the members! Remember to be yourself. One of my biggest fears entering the field was that I wouldn’t be able to be myself. But it is just as important to have fun as it is to work, and people need to know that we are a happy people. It was such a great experience to share the gospel with everyone I met and to testify to them of the things I know are true, and I know you will find that joy as well. I served in Sao Lourenco, which is a tourist town in the south of my mission. There, I had my first taste of Brazilian holiday culture. For one holiday, they would take chalk and draw up and down the streets with images from Christ’s life and of various saints. They are very religious and get very excited about holidays. Soccer is also a huge part of Brazilian culture. From 8 in the morning till 10 at night on Sunday you couldn’t find anyone on the streets because they were all watching the games. Kids would always play it in the street, and we would stop to play with them and then get to know their parents and teach them a lesson. Another great thing about Brazilians are so open. They are very willing to sit down and open up about their lives, and that’s part of the reason for the incredible missionary work down there. They’re also very close talkers -they’ll get a few inches from your face and use a lot of gestures. For etiquette, it’s important to compliment people’s food. Most of them come from a humble background, and it’s hard to find a good paying job down there, especially without a college education. Despite this, people sacrifice a lot to prepare a nice meal for their guests. One of the nicest things you can do is say thank you and tell them that their food was delicious. We would always try to do so, and most of the time it actually was that good. Other than that, people are very laid back and very kind people. Occasionally we would have Brazilian barbecue, which can be found at restaurants like Rodizio or Tucanos in the U.S. Basically they cook different kinds of meat and bring it around and skewer it for you. Some of my favorites were chicken hearts with lime and steak. One time a member served us goat’s stomach. I put the first bite in my mouth, and it was like chewing a rubber band. The texture was just like my tongue -it was porous and almost slippery. I couldn’t get through it, so I ended up forcing it down and swallowing small pieces whole. Brazilians, however, think that goat’s stomach is a treat. The staple is rice and beans, and the principal meal in Brazil is lunch. Normally the beans would be soaked whole in a sauce, and they would put “farofa” which is a type of gritty flower on top. They would normally serve some sort of meat like chicken or steak. Vegetable were always present as well, which you could put on top of your rice and beans or eat on the side as a salad. A traditional dessert there is “pudim,” which is a kind of flan with a smooth texture. Another favorite of mine is “Goiabada” which is Guava jelly smeared on cheese- it was very interesting. There’s no mission in Brazil where you have bikes or cars, and there’s very few grocery stores in general. However, there is a bread store and a “lanchonette,” or small burger place, on every corner. So instead of buying groceries, we would normally buy bread every morning for breakfast, eat lunch with a member, and then grab some hamburgers on the way home. It was a great opportunity though to meet a lot of new people and share the gospel with them. Inflation in Brazil was a huge problem in recent years. They used a currency called the Cruzeiro, but because of corruption and other economic conditions they introduced a new currency called the Real, which has helped to control inflation. I also know that many areas in southern Brazil have been colonized by Europeans, particularly Germans. Northern Brazil was settled more heavily by the Portuguese and was greatly influenced by the slave trade. Northern Minas was very hot year round. In the south however, it could actually get pretty cold in the winter. I actually saw snow on top of a mountain, and it would get quite foggy. In the middle of the state it would get hot during the summers, and cool (but not cold) during the winter. I even had to buy some gloves in the southern part of the state and use a heavy blanket to stay warm. However, up north it would still be 90 degrees in our house at night and we would try to cool down with fans. Get used to rice and beans, cause you’re going to eat them almost every day. Some richer members would serve something different, but it could be an option. In Brazil, lunch is the main meal of the day, and we would eat lunch with church members. Because of this, we weren’t allowed to eat dinner besides a small snack. It was hard to teach during the lunch hour because most people would be busy preparing and eating lunch with their family. Dinner, however, usually consisted of leftovers, and people were more open to visitors around that time. Besides rice and beans, Brazilians like to eat a variation known as Feijoada, which is a mixture of black beans and pork meat. I had it a lot, but one version I never tried was Feijoada with pork ears. Overall, rice, beans, and meat are the principal meal for any occasion. Sometimes they would serve these with a “salad” as well, which was generally just lettuce and tomato. Portuguese and Spanish are very similar, but there are a few differences in Grammar and Pronunciation. Portuguese is a lot more forgiving as far as word placement goes. A lot of people say that Portuguese sounds a lot like drunken Spanish, but that’s not quite the case. In Spanish you do have to annunciate a lot more, while Portuguese is a very slurred and fluid language. Spanish is choppier and more pronounced. Another difference is that the formal and personal forms of the word “you” are switched. In Spanish, “Tu” is informal and “Usted” is formal. In Portuguese, “Tu” is very formal and is generally only seen in the scriptures, while “você” is used more often. You only had to use four different conjugations in Portuguese as opposed to the six in Spanish, because “você” is conjugated just like he or she. I’m glad that I got to learn Portuguese because you don’t have to role your r’s. In spanish, if there’s two r’s you have to role them. In Portuguese, two r’s placed together (or at the beginning of a word) make an h sound. This threw me for a loop at first, but once you get used to the rules of pronunciation it’s very easy to learn the language form there. Belo Horizonte is generally a very safe place, and people generally wouldn’t bother us because we were missionaries and overall it is one of the safer places in Brazil. You do have to be smart though, and I would avoid carrying large amounts of money. As long as you don’t go looking for trouble and don’t make yourself a target, you’ll be safe. Minas Gerais has a lot of hills, especially in Belo Horizonte. Be prepared for your legs to hurt. Because of these hills, there are really crazy water patterns. In the city there would be no grass and lots of concrete, so when it rained, the water would run out onto the streets and could rise up to your ankle or even up to your shins. It can also get quite sunny, so I would recommend wearing sunscreen. It’s also important to bring sturdy shoes because of the hills and poorly paved roads in the countryside. Brazilians are very open to meeting strangers, this can vary by region, they will let you in and be willing to hear what you have to say. People are also very patient with the language and will stop to listen if you are trying. They won’t correct you, but they will understand what you are trying to say. (This can be very frustrating when you are trying to learn though). Brazilians don’t work the typical 9 to 5 -they’ll work all day every day. A lot of times, families won’t see each other all day because the Mom will work during the day and the Dad will work at night. Sometimes they’ll have rotating schedules where they’ll get two days off, which days those are will change. This made it hard for people to come to church, because often they wouldn’t get Sundays off, or at least not every Sunday. It was also hard to find a whole family at home because of their crazy schedules. In america, we’re very comfortable with a 9-5 schedule where the kids get out of school at 3 every day, but in Brazil that’s simply not the case.